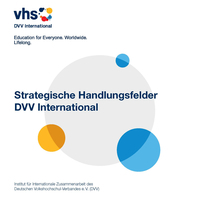 DVV International is the Institute for International Cooperation of the Deutscher Volkshochschul-Verband e.V. (DVV), the German Adult Education Association. DVV represents the interests of the approximately 900 adult education centres (Volkshochschulen) and their state associations, the largest further education providers in Germany. As the leading professional organisation in the field of adult education and development cooperation, DVV International has committed itself to supporting lifelong learning for 50 years. DVV International provides worldwide support for the establishment and development of sustainable structures for Youth and Adult Education. We are a professional partner in dialogue with the local people. To achieve this, we cooperate with more than 200 civil society, government and academic partners in more than 30 countries in Africa, Asia, Latin America and Europe. 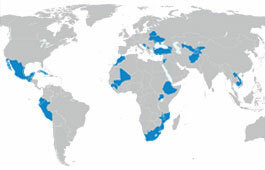 Our country and regional offices build local and regional cooperation and ensure the quality and effectiveness of our action in our partner countries. Our work focuses on literacy and basic education, vocational training, global and intercultural learning, environmental education and sustainable development, migration and integration, refugee work, health education, conflict prevention and democracy education. DVV International finances its work through funds from the Federal Ministry for Economic Cooperation and Development (BMZ), the German Federal Foreign Offi ce, the European Union, as well as other donors. In concert with national, regional and global adult education associations, DVV International promotes lobby work and advocacy for the human right to education and for lifelong learning. To achieve this, we orient ourselves on the UN Sustainable Development Goals (SDGs), the global education agenda Education 2030 and the UNESCO World Conference on Adult Education (CONFINTEA). DVV International supports the European and global exchange of information and expertise through conferences, seminars and publications. We fight poverty through education and support development. As a globally acting professional organisation for adult education, we build a sustainable system for further education along with citizens, educational organisations and governments. Together with the people in our partner countries, we establish places for lifelong learning.